It's time to meet the folks that keep Cimetrix running - our Front Office team! 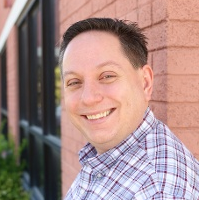 Meet Brice Laris, Human Resources Manager at Cimetrix. How long have you been working at Cimetrix? I've been at Cimetrix a little under a year. What is your role at Cimetrix? I am the Human Resources Manager. What drew you to Cimetrix originally? The opportunity to create a Human Resources organization for a company that had never needed one, but now did because of its growth. What do you enjoy most about the work you do? The opportunity to train employees on the “soft skills” that help them to be successful. What do you find to be most challenging about your job? Finding candidates that are a great fit for our specialized positions. At Cimetrix, we want talented people, who want a long term career, and who can exemplify our company’s core values of Integrity, Team, Growth and Clients. Finding one of those attributes is easy, two is challenging and three is down right difficult. But when you do find that great candidate and there is alignment between what we want and what the candidate wants, it is a great day! What are your top 3 favorite movies and/or books? Movies: 1. Independence Day, 2. all of the Star Trek movies JJ Abrams didn’t do, and 3. Hamlet 2. Travel, especially to places where there is a beach or a Disney park. I also read about 24 books a year, play video games and take care of my three cats.